This newly updated two-story townhouse is located on the outskirts of the golf course on the Hidden Valley Resort. 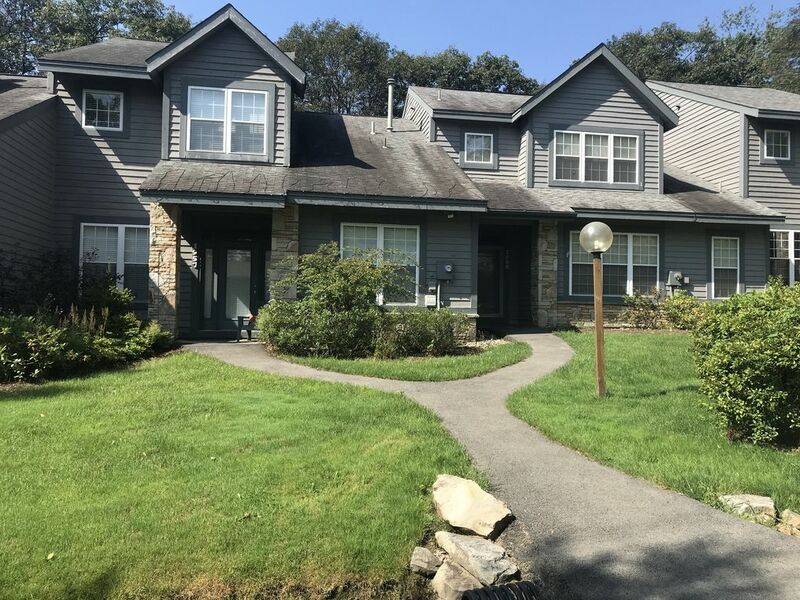 Whether you are coming for a ski weekend or golf getaway, this beautiful townhome is a great way to spend time together any time of year. Just a short walk to the outdoor pool, playground, and basketball court for some summer fun! Back deck providing secluded relaxation. The master suite features a king size bed, cable TV and a private bath with his and her sinks. The second bedroom features a king bed while the third bedroom offers two sets of twin bunk beds. There's a sleeper sofa in the loft for additional sleeping. Central AC for summer comfort!! parking is first come first serve. Two cars permitted per unit. Our group had a great time at this residence. The kitchen had plenty of utensils and accessories and the open layout downstairs made being together as a group very easy. We thoroughly enjoyed our stay for a family reunion during ski season. The condo is ~1/2mile from Hidden Valley, I would not call it ski in/ski out, but close enough to make all the activities very convenient. 7 Springs was 20 min drive. The facilities were well-maintained--all the kitchen appliances were current, in good working order and we never found a single item that we were lacking. Beds were extremely comfortable. No draftiness. Showers and towels were fine. We used the washer/dryer quite frequently. Snow removal on roads was prompt in the morning. All in all, a very smooth stay and we would be happy to rent this condo again! the property was beautiful, everything was amazing!! Great place to stay. We skied at both Seven Springs and Hidden Valley and both were close. HV is down the road and Seven Springs is a 20 minute drive away. House has all the dishes, pots & pans, etc. I would stay there again. Advertised as "Ski In. Ski Out"....which means Walk out the front door, cross Road #1, Climb up a hill through briars, Cross over (take your pick) someone's back yard (waving to them in their hot tub), Cross Road #2, Walk through mud, Climb up a steep snowy slope, and Hey!, you've skiied out!! Weekly rates based on Friday to Friday or Sunday to Sunday stays. Holiday time frames are subject to three night minimums and higher rates. Standard rates do not apply mid-Dec through mid-Mar. Winter season and long term stays available, call for details. 9% occupancy tax due on any rental shorter than 30 days. Cleaning, linens and towels included in above costs.